Curing, naturally smoked, applewood - We use terms like these when talking about DI LUSSO® Applewood Smoked Chicken, but what do they mean? How do they affect things like taste, texture and flavor? Let us be your guide as we explore these questions. Before being smoked, meats typically go through a curing process. Curing is especially important for lean meats, like our 98% fat-free Applewood Smoked Chicken, because It helps ensure the meat is tender and moist. Curing also accentuates the chicken’s natural flavoring, which can easily get lost during the smoking process. Next comes smoking. Generally speaking, smoking is a process used to flavor, cook or preserve food by exposing it to burning wood. Our Applewood Smoked Chicken is naturally smoked, which means artificial flavors - like liquid smoke - are not injected during smoking. 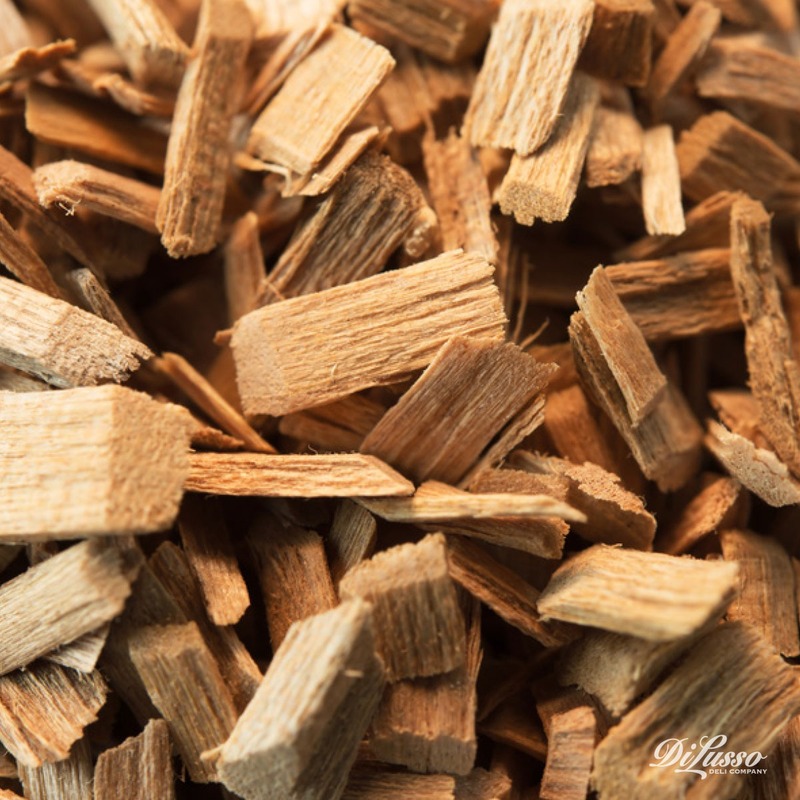 Hardwoods are most often used in smoking because they’re denser and burn slower. Within the hardwood category, there are heavier and lighter woods. Heavier hardwoods - like mesquite and hickory - work better with fattier meats such as beef and pork. Lighter hardwoods, like cherry and applewood, pair nicely with leaner meats such as poultry and fish. Our Applewood Smoked Chicken is smoked over natural applewood chips, which have a mild yet sweet flavor that’s subtle compared to other woods. Because of its light touch, it can take much longer for flavors to become pronounced enough to taste. The end result is tender, smoky-sweet and extraordinarily versatile, meshing well with a variety of cooking styles. Take a peak at how it adds something special to the three very different recipes below. We love how our Applewood Smoked Chicken (at your deli counter, ask for it to be sliced at a 9 thickness) adds a layer of smoky flavor to this otherwise zesty dish filled with seasonings like pepper, five-spice powder and cilantro. 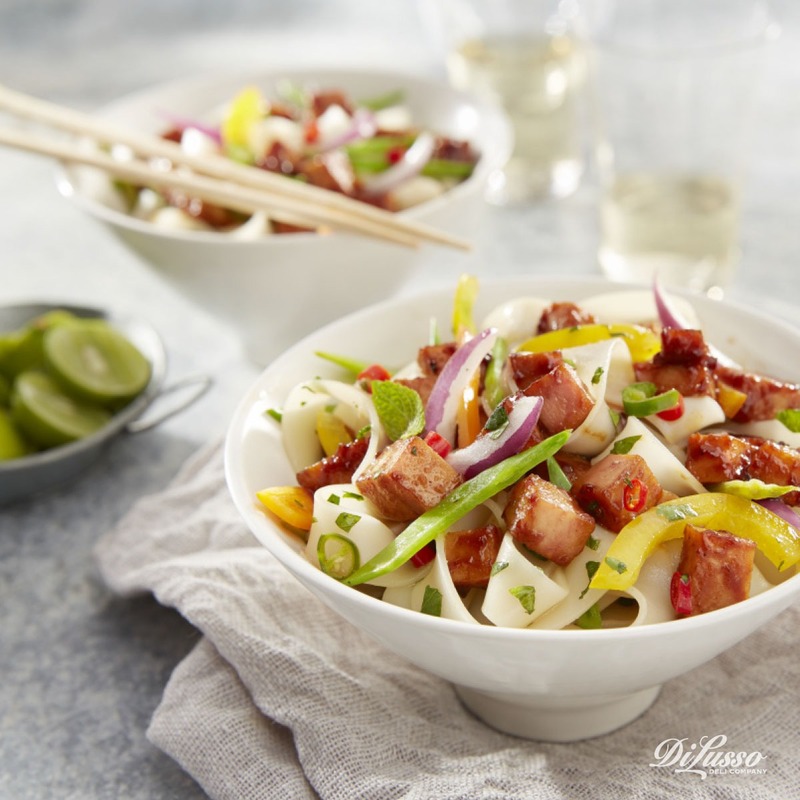 Bell peppers, red onions and snow peas round it all out with a satisfying crunch. 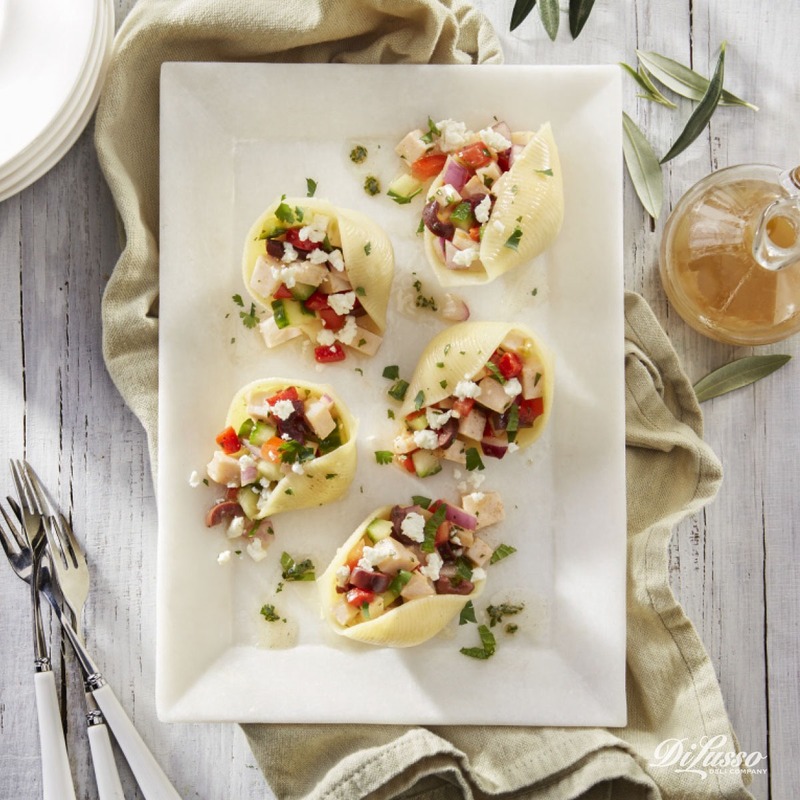 These little pockets are overflowing with bold Mediterranean flavors: tangy feta, rich DI LUSSO® Kalamata Olives, and Roasted Red Peppers imported from Northern Greece. Our Applewood Smoked Chicken diversifies the experience by adding bursts of smoldering sweetness (at your deli counter, ask for it to be sliced at a 7 thickness). 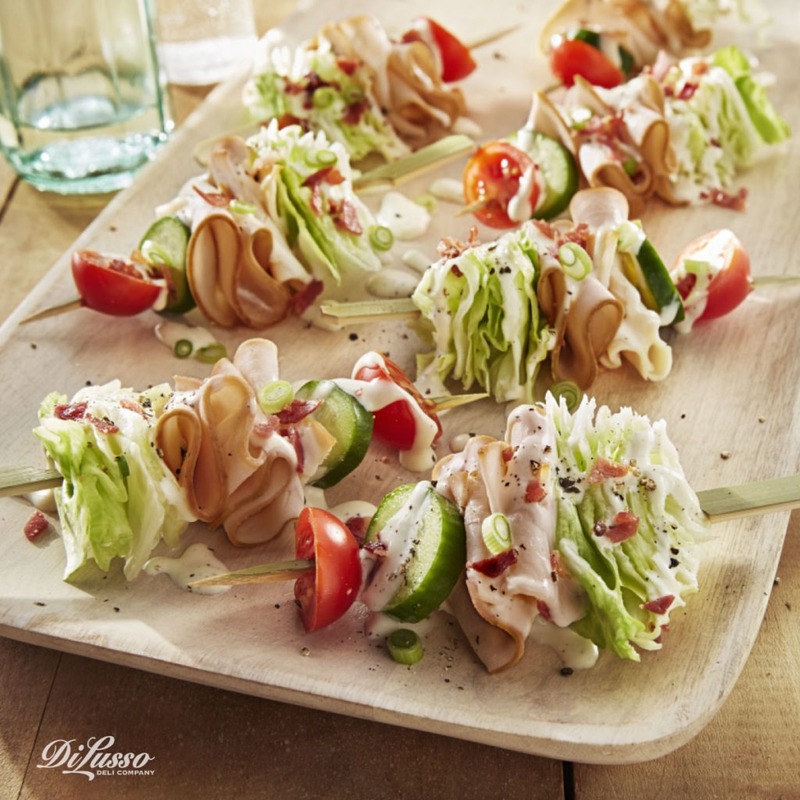 We upped the wedge salad’s game by introducing some flavorful new players: DI LUSSO® Applewood Smoked Chicken, fresh cucumbers and green onions. The perfect combination of smoky and sweet, crisp and creamy. Our Applewood Smoked Chicken is unique in many ways and is held to the same standards as the rest of our meats. As promised, it’s produced gluten-free, and does not contain binders, fillers, artificial colors or added MSG. It’s this attention to detail and unwavering dedication to quality that gives all our meats such authentic, rich flavor.